Save time prepping your classroom for the next day's assignments with the K5 Seatwork Digital Teaching Aids. Utilizing this format provides additional teaching space on your board as the content of the students copy is now either projected on a screen or wall or can be printed on large charts for display. Students improve their cursive writing skills including formation, size, space, and slant as they copy from large, colorful writing examples. Available in both cursive and manuscript version! 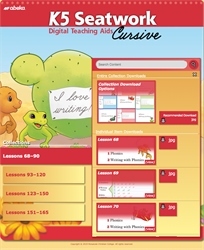 These Digital Teaching Aids coordinate with the K5 Curriculum to provide board work for daily seatwork lessons. Seatwork is completed three days a week, beginning in Lesson 68, and increases to five days a week as the year progresses. Digital Teaching Aids are broadly compatible with your favorite presentation software that supports .mov, .mp4, and .flv file formats, whether you are running the software on a computer, tablet, or other mobile device; and can be projected using a smart board, screen, television, or can be printed on a poster-sized chart for display.